It’s hard to shake the feeling that Uncharted: The Lost Legacy is the b-side of the Uncharted series. It’s not bad by any means; Naughty Dog has established a formula with Uncharted such that as long as the game sticks to the formula that it can’t possibly be bad. 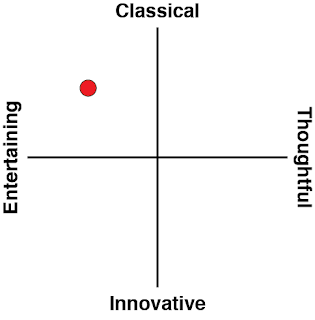 But at the same time, it’s a game greatly lacking for inspiration and gravitas. The game follows the story of Chloe and Nadine, two minor characters within the expanded Uncharted universe that are both fan favourites and, previously, underdone within the franchise. This game, originally intended to be a bit of DLC for Uncharted 4, is Naughty Dog’s way of trying to build out the characters. And from that perspective, it has largely succeeded. We certainly come out of the other end of the game with a better sense of both characters, and a relationship between them that is something the developer could potentially build on in future games. Both ladies have their issues that they work through over the course of the game, but as the chief protagonist, it’s Chloe’s daddy issues that form the bulk of the “deep-and-meaningful” moments within the game. Chloe’s dad was a treasure hunter obsessed with finding a particular priceless Indian artifact, and pursued that with such ambition that young Chloe felt quite abandoned. Now, a renowned treasure hunter herself, as luck would have it, Chloe is after that same treasure. As for what happened to her dad... well, that's covered in the game, but there's a specific spoilers embargo prohibiting me from talking about it at all. 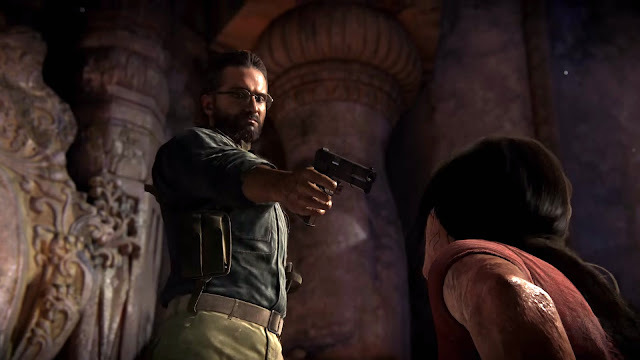 There’s a real dissonance within the story of The Lost Legacy that I was never able to move past; if Chloe’s dad really did completely abandon his kid to chase after this artifact for year after year, he was a terrible treasure hunter in never being able to actually find it. For a “hidden” object of antiquity, this particular artifact isn’t particularly well hidden. The various locations that house the puzzles that need to be solved to progress towards the treasure may as well be lit up with neon markers, because they’re not exactly hidden, and the puzzles themselves designed to stop people from unlocking the secret doors protecting the artifact would not challenge a halfway intelligent monkey, much less a seasoned treasure hunter. We’re meant to suspend belief and just accept that Chloe and Nadine are doing things that parents and bad guys alike just haven’t been able to figure out through years of research and incredible resources, but The Lost Legacy never managed to get me over the line there. I’m also not sold on that aforementioned villain - Asav. In the opening chapter of the game we’re told that there’s a civil war going on, and this fellow is also looking for the artifact (for reasons, and obviously it wouldn’t be fun to give that away in the review). Nadine and Chloe end up in conflict with this guy because they want the artifact too, but that’s where the explanation starts and stops. I feel like there’s a solid chapter was needed up-front to do a better job of justifying these two’s involvements in events. Worse, though, and something I highlighted in my preview, is that this plays out as a person of mixed heritage, but nationally Australian, and a South African, pillaging treasures from India and stopping an Indian from acquiring them - with bullets and violence. 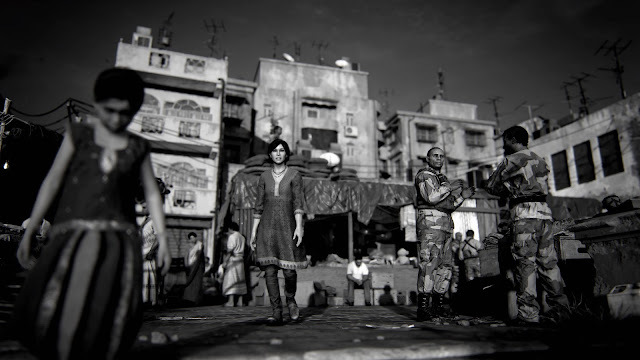 I’m really not sure if Naughty Dog was aware of what it was doing in crafting a story about representatives from British Commonwealth nations looting India, but I would hope that if the writers were aware of the symbolism inherent in that, they would have rethought that scenario. In the preview session I was only experiencing an early part of the game, and it left me really concerned on this theme. The full game does do a slightly better job of justifying the setting and scenario, but never really engages with it, and I certainly think Naughty Dog’s writers could have been more questioning about Nadine and Chloe’s motives and actions; too much of The Lost Legacy is a contrivance and assumes a standard good/evil breakdown which is just nonsense and juvenile. Generally speaking that’s my biggest issue with The Lost Legacy. It’s a narrative-driven game that does a good job of building out the Uncharted universe and giving us greater insights into a couple of its key characters, but it also fails to offer any kind of depth or substance beyond that focus on basic characterisation. There were so many opportunities to explore deep, rich themes in this game, but time and time again the developers instead opt for passive entertainment; simple sarcasm for humour and to build Chloe into a cynical character; gorgeous vistas and plenty of ruins to explore to distract us from ever asking why. I appreciate that Uncharted is all about blockbuster popcorn entertainment, but in chasing that it’s difficult for me to get really engaged or interested in what’s going on. I have issues with the gameplay itself, too. 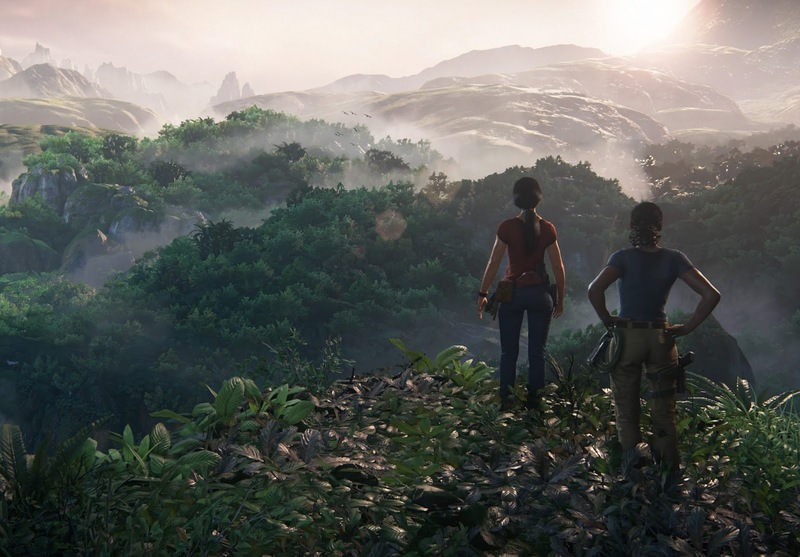 One of the key features that was being touted in the lead-up to the game’s release was the size of the world that you’ve got to explore, with The Western Ghats region, in particular, being almost open-world in scope. 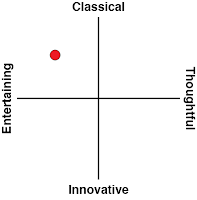 The problem is that there’s nothing particularly intriguing or memorable about the space; all the action is concentrated within particular areas, and the “open world” bit is a complete waste of time; all you’ll be doing is driving from point A to point B, and listening to the occasional bit of banter between the two characters. Then you’ll arrive at the target location, the two women will jump out of the car, and then the actual activity starts, with enemies to stealth around or shoot, in a contained space the size of a normal Uncharted level. Anything that does happen is heavily scripted and only reinforces that this "open" area is a contrivance and, frankly, a waste of development resources as a consequence. It’s also a superficial openness that responds to players in no way. In the preview session I had with the game, I had a number of different ruins to choose between. I picked one and, upon completing it, Chloe and Nadine had a conversation. When playing the game for review, I tackled a different ruin first, but Chloe and Nadine had exactly the same “first” conversation when I finished that one. It’s immersion-breaking, because there’s absolutely no environmental context to what Chloe and Nadine do; or put another way they do the same thing regardless of what you do, and the game may have well been a linear sequence of levels, because this “openness” is not capitalised on in any meaningful way. For all this criticism (and I realise there has been a lot), Uncharted: the Lost Legacy remains fun. Naughty Dog’s formula is just so refined and clean that there’s no way it can’t be entertaining. As always you can approach levels all-guns blazing, or you can make good use of the environment and the long grass to sneak around and take enemies out by stealth. I’m a fan of the latter approach; there’s something really thrilling about carefully monitoring enemy movements, working out a path through them, and then taking each and every enemy out without using a single bullet. There are moments where it’s effectively impossible to stealth your way through, but Naughty Dog has done its usual fine effort in giving you plenty of room to maneuver and sneak your way through the game. 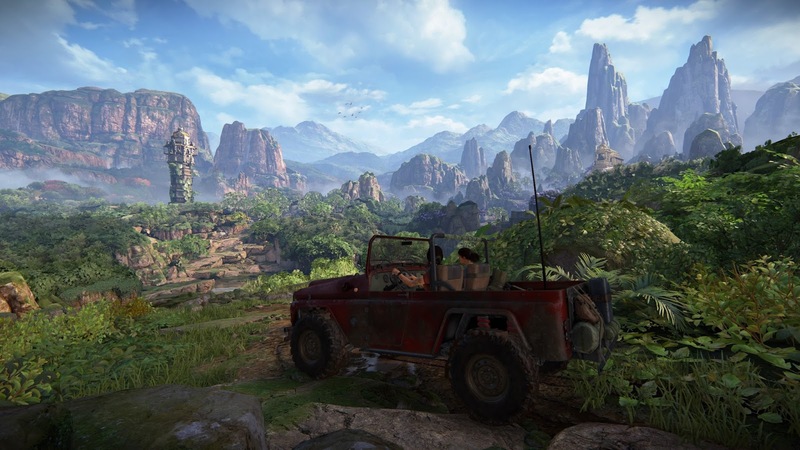 Related reading: Matt's review of Uncharted 4 on PlayStation 4. Gunplay is great, too, and I love the new lockpicking mechanic that has been introduced into the game. There are large boxes scattered through environments that hold really powerful weapons and other treasures. These can only be accessed by playing a lock-picking minigame, and there’s always the risk that, if you take your time with that, you could get caught. Unless, of course, you dispose of all the enemies first, but the loot in the box might be a big help in doing that. Uncharted’s one of those games that I recommend playing on as high of a difficult setting as possible, in order to really make every move count. It works perfectly fine as a shooter, but it’s so much more when you decide to play it strategically. Uncharted: The Lost Legacy plays flawlessly. It’s impossible to criticise the level design, the basic mechanics, or indeed anything that involves pressing buttons. Naughty Dog is simply a developer of such quality that it’s not going to make mistakes there. But I like my games to have narrative, and I like games that get me thinking. I like my games to have purpose, and I find The Lost Legacy to be a very purposeless game. It’s fun, I enjoyed my time with it. I doubt I’ll ever feel inspired to play it again, much less remember it.